The Wind Operator Congress Europe went really well for the RBE team. Important contacts were established and very interesting discussions regarding several aspects of the Rotor Blade Extension and its benefits were held between the team and relevant stakeholders, which has sparked a great deal of interest in the project. Lessons learned from the applications of Rotor Blade Extension. 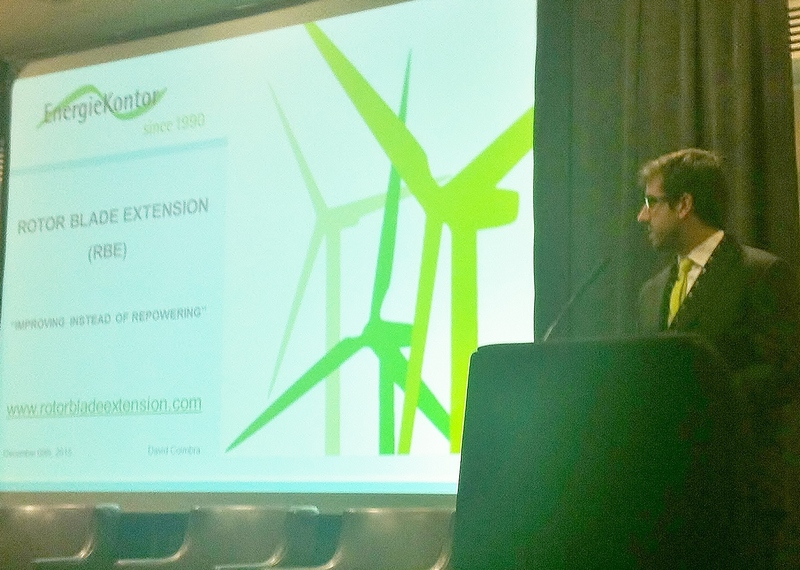 Held between the 8th and 10th December 2015, at The Gouman Tower Hotel, in London, the Wind Operator Congress Europe brought together “leading owner operators, OEMs and service providers in the pursuit of strategies, models, tools and practices to deliver operational excellence across Europe’s ever growing on and offshore wind power operations”. What are the extra efforts that the turbine suffers from the installation of the RBE? How are the certification and licensing processes carried out, in order to install the RBE? Besides the current products, are there any plans for developing the RBE for other turbines? How is the product sold, and is it a final sale or is there also risk-sharing for the installed product? Does the RBE product affect the lifetime of the turbine? What solutions have been designed for the Lightning Protection System? Please follow our news on the Rotor Blade Extension in order to receive answers to these questions. You can also email us to energiekontor@rotorbladeextension.com or drop us a call, and talk directly with us for more information.